My grandmother made her own hats, perfect pastry, and vestments for the clergy. Sitting at a large table in her spectacular creations, she sewed minuscule stitches on rich garments with a group of doughty ladies of the parish. As her young companion, I learned the meaning of effect and detail at that table, and it was only when I grew up that I appreciated the importance of how much I had absorbed from the women who particularly helped me during those sessions. Years later, I lived by the sea, without electricity, on a small island off the west coast of Scotland. Elemental extremes and resourcefulness were an integral part of my life. My work practices evolved to embrace the lack of power, rather than be frustrated by it and, although I now have electricity, I do live in an area that has frequent power cuts, so retain a sense of slow, labour intensive careful work. I like to create a sense of indulgence especially within the pearl pieces and this mainly results in admiration for jewellers who have made beautiful intricate work for thousands of years with basic tools. I try to include an element of practicality and timelessness in everything I make. I make each piece of jewellery by hand, using few machines and basic tools. 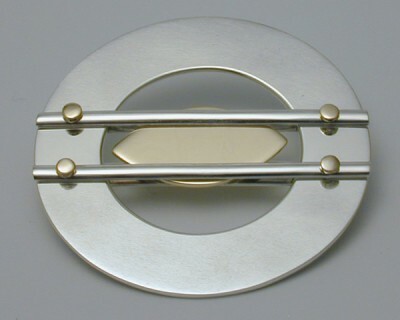 I work in silver and gold, weaving fine threads into delicate necklaces, hammering textures for highly polished earrings, balancing acrylic pieces in silver, constructing tactile brooches, making wedding rings and working to commission. I have been knitting, crocheting and weaving precious metals for years, developing the traditional skills I was taught as a small child, literally at my mother’s and grandmother’s knees. 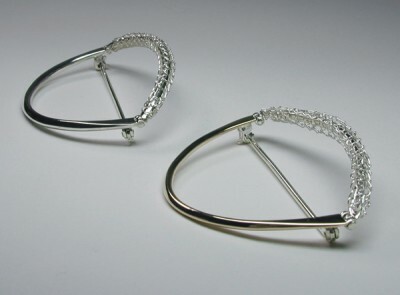 This has led to experimenting with pure silver seamless tubular knitting and other materials. Some pieces have moving parts and in others the movement is just an illusion. Some pieces include knitting and fine wirework, and in others the detail is in the perspective and contrasts of the materials, all deceptively simple ideas that illustrate the jeweller’s art. I find that with an assiduous focus on the results, there is always work in progress and always more to explore. © Natalie Vardey. All Rights Reserved 2012.